Recent heavy rains have blocked access to much of the Pacific Coast, the only birders seeing quetzals on Cerro de la Muerte for the next week or so will be those who trek up the “mountain of death” on foot, and collapsed bridges have even isolated the Guanacaste beaches of Samara and Nosara. This past weekend didn’t seem like the ideal time to go birding in Costa Rica (and it wasn’t) but since I hadn’t heard of any landslides on Volcan Irazu, I didn’t cancel a Saturday guiding stint up on this massive volcano that overlooks the Central Valley from the east. 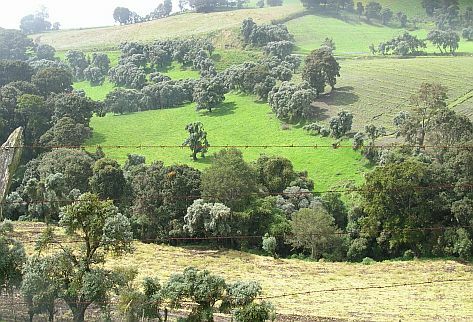 The weather was looking nice around San Jose but sure enough, when we approached Cartago, misty surroundings reminded us that we had essentially entered a slightly different climatic zone. I hoped that the foggy air would clear the higher we went, that maybe we could break on through the wet blanket as we ascended the mountain. It was pretty misty at our first stop at a ravine that hosted remnant cloud forest but not too thick to watch Volcano Hummingbirds zipping around, Band-tailed Pigeons alighting in the trees, Slaty Flowerpiercer doing its usual, hyperactive, nectar robbing thing, and Common Bush-Tanagers sharing the undergrowth with Wilson’s Warblers (the bush-tanagers here at the upper limits of their range). Buffy-crowned Wood-Partridge and Flame-colored Tanagers also called within earshot but playback couldn’t entice them to come out and play. Further up, at our next stop near the Nochebuena Restaurant, we didn’t exactly leave the clouds behind but we at least seemed to have climbed above the main strata of saturated air. Tame, Sooty Robins greeted us from the tops of purple fruiting bushes. 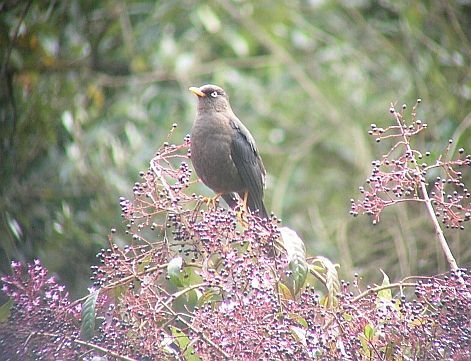 Sooty Robins are big, common, high elevation thrushes endemic to Costa Rica and western Panama. 1. As a kid in Niagara Falls, New York, I associated them with the wild, exotic, unreachable coniferous forests of the American west. This meant that they hung out with Steller’s Jays, Grizzly Bears, Elk, Cougars, and Jeremiah Johnson which in turn meant that they were on the uber cool end of the awesomeness spectrum. 2. They aren’t Rock Pigeons. 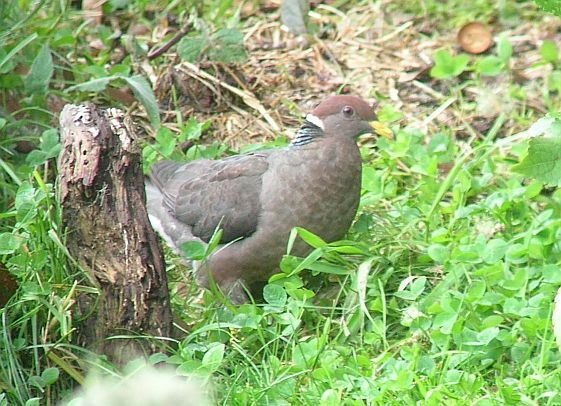 As iridescent as the necks of Rock Pigeons (aka Rock Doves) could be, they were just too common to be cool and were black-listed by the dreaded “introduced” label. 3. I am crazy about birds. I just like watching birds no matter what my binoculars bring into focus so this could be a simple explanation. 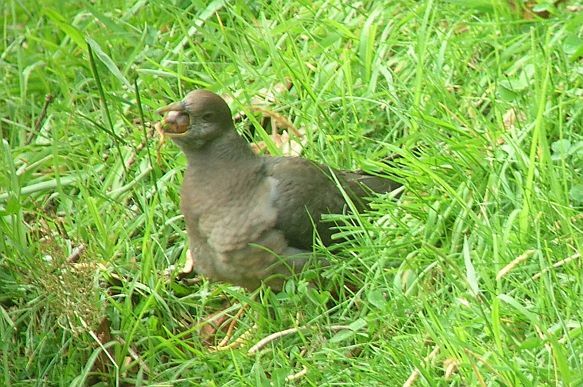 A young Band-tailed Pigeon looking kind of grotesque as it chokes down an acorn. I love the dark green nape! First we saw a female who was nice enough to provide us with stellar scope views before she swooped off into an oak grove across the street. I figured this was my cue to use the outdoor facilities and of course as soon as I stepped behind a tree, the unmistakable, long-trained silhouette of a male quetzal appeared over the road as it flew into the same tree where the female had been. 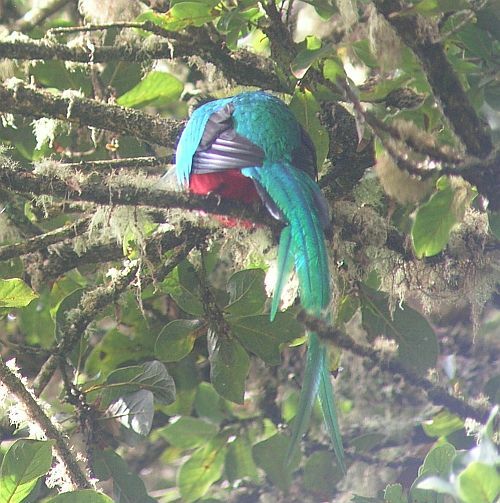 A closer look at said tree showed why is was the favored hangout of those Irazu quetzals. It was a Laureacae species or “wild avocado” and its branches were dripping with the energy rich fruits that quetzals probably require for survival. Running back across the road, the vivid emerald green of the male was immediately apparent and we enjoyed scope views of this always fantastic bird for 15 minutes while Acorn Woodpeckers laughed from the treetops and Sooty-capped Bush-Tanagers flitted through nearby vegetation. 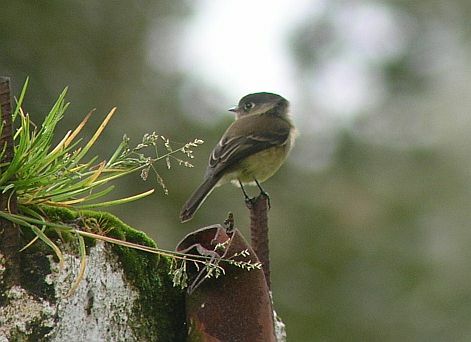 It was also nice to see Black-capped Flycatchers, an easily identifiable Empidonax only found in high elevation forests of Costa Rica and western Panama. Once the quetzals had retreated back into the shade of high elevation oaks, we made our up to the treeline habitats of Irazu National Park. Unfortunately, the fog had come back with proverbial pea-soup vengeance and although we could walk over the ashy ground to the very edge of the crater, we couldn’t see any further than a couple hundred feet at the most. Thus, the green lagoon at the bottom of the crater was hidden from view but at least (since we were birding and not really volcanoing) we got Volcano Juncos! 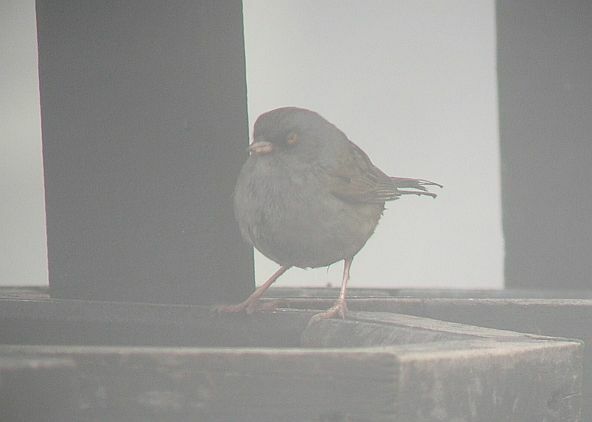 Volcano Junco, the fierce looking denizen of paramo habitats in eastern Costa Rica and western Panama. As is typical for high elevation birds in many areas of the world, they were tame, rather fearless, and had no qualms about picking at food scraps left over by tourists. Heck, they and the local Rufous-collared Sparrows even jumped right into the trash bins! Hmmm, what did the tourists leave for my lunch today! 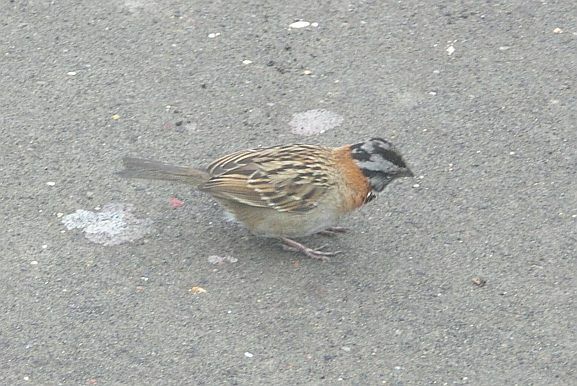 A Rufous-collared Sparrow getting ready to jump into the garbage. Visibility worsened as the mist turned into a light, horizontally falling (blowing?) rain and so we left the crater area and took a side road just outside of the park limits to hopefully see Large-footed Finch and Timberline Wren. 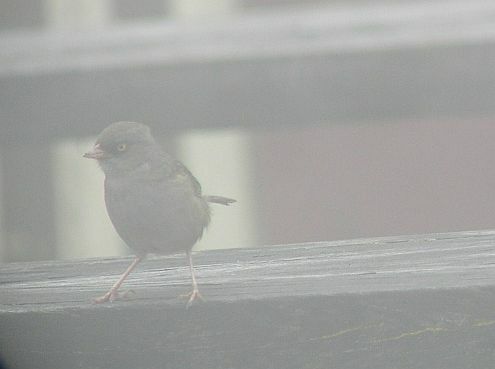 We got more excellent looks at juncos and heard a distant finch with an extra large shoe size but there was nary a peep nor rustle of vegetation from any Timberline Wrens so we slowly drove back down to the Nochebuena Restaurant with the hope that the fog would dissipate. The restaurant doesn’t exactly have an extensive menu, but it’s good enough, is the coziest place on Irazu, and has hummingbird feeders that can be watched from some of the tables. We of course, sat at the best spot in the house for the hummingbird spectacle and studied four of the species that occur high up on Irazu; Green Violetear, the tiny Volcano Hummingbird, needle-billed Fiery-throated Hummingbirds, and the giganto Magnificent Hummingbird. 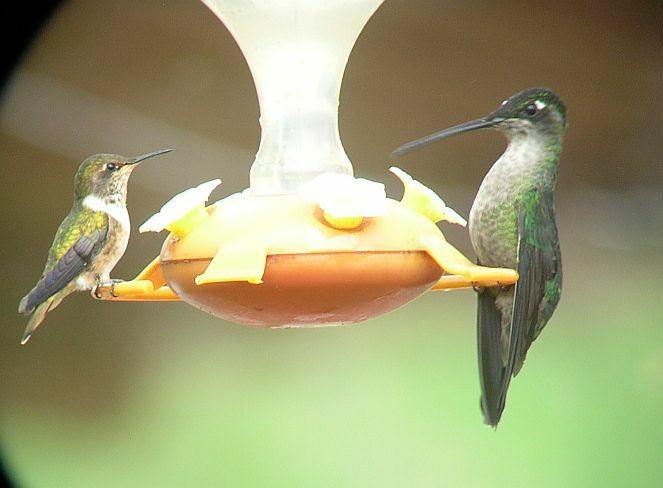 A female or young male Volcano Hummingbird sharing the feeder with a female Magnificent Hummingbird. After lunch, a brief respite from the mist got us one of our best birds of the day. A bunch of scolding birds had gotten our attention and as we walked towards them, I noticed a Sooty Robin make a swooping dive at a fence post. A closer look showed that it was more concerned with what was sitting on the fence post, a brown lump that turned into a Costa Rican Pygmy-Owl when viewed through the scope! It took off before I could digitally capture it but at least we all got perfect looks at this uncommon, highland endemic. 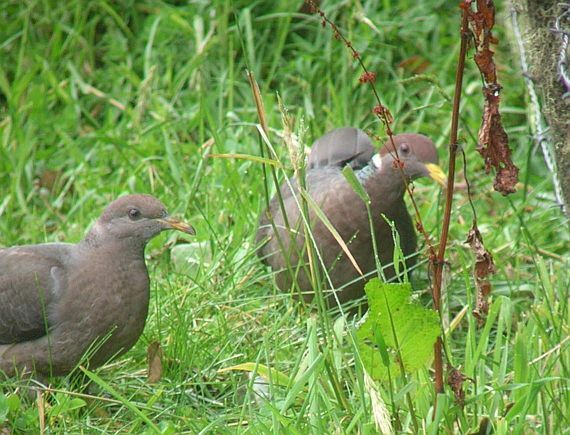 Interestingly enough, this was in the same spot where I got my lifer Costa Rican Pygmy-Owl in 2008. 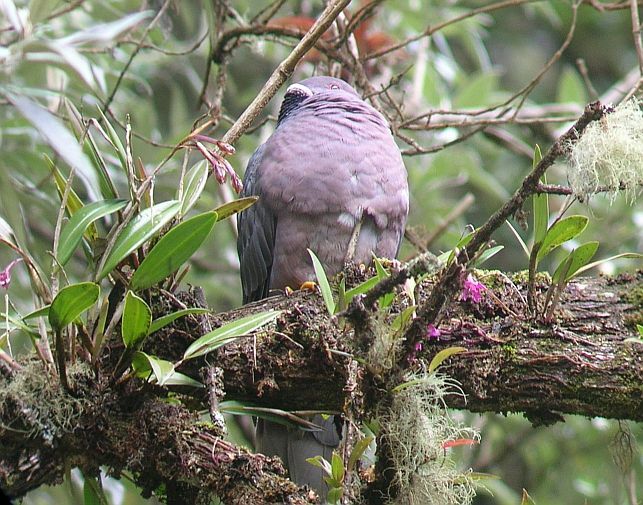 Aside from more Band-tailed Pigeons walking around, not much else showed so we went further down the mountain in search of sunshine and birds. Incredibly, we did manage to find the only sunny spot on Irazu and the rich undergrowth also made it excellent for birds! The one sunny spot on Irazu. Thanks to the good visibility, good habitat, and good luck, we watched a mixed flock near this area for around 40 minutes. A bunch of new birds for the day and others we had already seen showed up in the form of Yellow-winged Vireos (very kingletish and common on Irazu), Spot-crowned Woodcreeper, Ruddy Treerunner, Yellow-thighed Finch, Sooty-capped Bush-Tanager, Black and Yellow Silky Flycatcher, Mountain Elaenia, Wilson’s Warbler, and Black-cheeked Warbler. These were our last birds for the day because below the sunny spot, the fog was so thick we could barely make out the road until we had descended the mountain and left the Cartago area. The weather was a bit trying but at least we didn’t have to contend with driving rain, landslides or washed out bridges. Since we also had perfect views of Resplendent Quetzal and Costa Rican Pygmy-Owl, I daresay that we had a better day of birding than most birders in Costa Rica on November 6th, 2010.